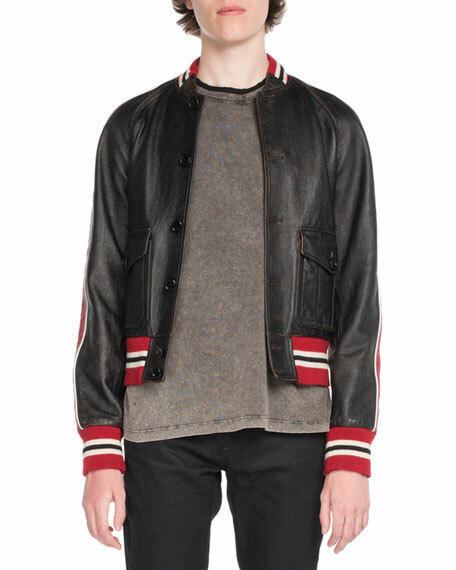 Saint Laurent "Teddy" bomber jacket with contrast trim. ATM Anthony Thomas Melillo bomber jacket in textured boucle. Stand collar; snap front. Long raglan sleeves. Banded cuffs and hem. ATM Anthony Thomas Melillo bomber jacket in textured boucle. Stand collar; snap front. Long raglan sleeves. Banded cuffs and hem. Side snap pockets. Polyester/acrylic. Lining, cotton. Imported of Italian material. Model's measurements: Height 6'1"/185cm, waist 32"/81cm, typically wears size M.